Welcome to The Avenue Clinic’s guide to Transcutaneous Electrical Nerve Stimulation. Electrical nerve stimulation is a treatment for pain that can be used for acute pain (e.g., during labor or after surgery) or for chronic pain (e.g., low back pain). It is a form of electrical energy sent in various waveforms to the nerves. When it is delivered through electrodes or patches placed on the skin, it is called transcutaneous (meaning through the skin) electrical nerve stimulation or TENS for short. TENS is a noninvasive way to override or block signals from the nerves to the spinal cord and brain. Pain messages may be altered enough to provide temporary or even long-lasting pain relief. In addition to controlling pain, this type of electrical stimulation can also improve local circulation and reduce or eliminate muscle spasm. Who may benefit from a TENS? TENS can be used for relief of pain associated with a wide variety of painful conditions. 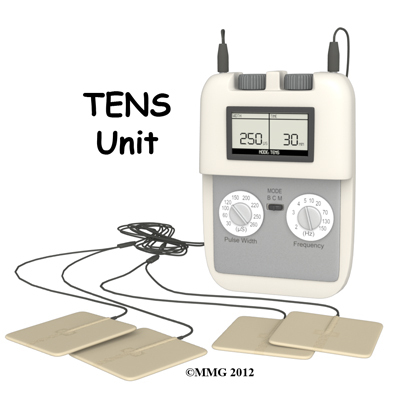 Back pain caused by spine degeneration, disc problems, or failed back surgery is commonly relieved by the use of TENS. Nerve pain (neuropathy) from conditions such as chronic regional pain syndrome (CRPS) or diabetes may also be managed with TENS. TENS has been used for people suffering from cancer-related pain, phantom-limb pain (a chronic pain syndrome following limb amputation), and migraine or chronic tension-type headaches. TENS can also be used for muscle soreness from overuse, inflammatory conditions, and both rheumatoid and osteo-arthritis. Athletes with painful acute soft tissue injuries (e.g., sprains and strains) may benefit from TENS treatment. Sometimes TENS is used after surgery for incision or post-operative pain (e.g., joint replacement, cardiac procedures, various abdominal surgeries, or cesarean sections). Studies show that TENS can significantly reduce the use of analgesics (pain relievers, including narcotic drugs) after surgery. TENS is usually used along with other forms of treatment and pain control such as analgesics, relaxation therapy, biofeedback, visualization or guided imagery, physiotherapy, exercise, massage therapy, nerve block injections, and/or spinal manipulation. TENS machines produce an electrical impulse that can be adjusted for pulse, frequency, and intensity. The exact mechanism by which it works to reduce or even eliminate pain is still unknown. There are several possible ways TENS works. For example, TENS may inhibit (block) pain pathways or increase the secretion of the pain-reducing substances (e.g., endorphins, serotonin) in the central nervous system. TENS is a noninvasive way to treat pain. Pain messages may be altered enough to provide temporary or even long-lasting pain relief. Besides controlling pain, this type of electrical stimulation can also improve local circulation and reduce or eliminate muscle spasm. Recent research has also shown that autosuggestion or the placebo effect is a powerful way many people experience pain relief or decrease their symptoms. This means that by simply believing a treatment it has a beneficial effect on the nervous system. This effect can be true for the positive effects of using TENS as well. You will be shown how to use your TENS device by your physiotherapist at The Avenue Clinic. Round or square rubber electrodes are applied to the skin over or around the painful area. The electrodes are self-adhesive with a protective layer of gel built in to prevent skin irritation or burning. Usually four electrodes (two pairs) are used to get maximum benefit from this treatment although two electrodes can also be used and in many cases provide sufficient relief. The unit is battery-operated with controls you manipulate yourself to alter the strength of the electrical signal. The unit can be slipped into a pocket or clipped to your belt. The electrodes will be placed on your body at positions selected by your physiotherapist. The electrode placement is determined based on the location of the involved nerves and/or the location of your pain. Most often the electrodes are placed either directly over the painful area or on either side of the pain. Once the electrodes are in place, the intensity of the unit is turned up until you feel a buzzing, tingling, or thumping sensation that is strong but comfortable. If placing the electrodes directly over or surrounding the painful area doesn’t work, more relief may be gained by putting the electrodes over the area where the spinal nerve root that supplies the painful area exits the vertebra. Your physiotherapist will guide you through the trial-and-error process for finding the best electrode placement for you and will make any changes needed in the program to suit your comfort level and your needs. Another way to use TENS is over spots in the muscles called trigger points (TrPs). Trigger points are areas of hyperirritability in the muscles that can cause chronic pain. Your physiotherapist will identify any TrPs present during their physical examination. Significant pain relief may be achieved with as little as 20-30 minutes of TENS use. Some patients find relief of symptoms for 1-2 hours even after the unit is removed. How long you use it will depend on the cause of your symptoms (i.e. post-operative pain vs chronic low back pain), the pain intensity, and the chronicity of your pain. For certain conditions like chronic pain or for women in labour, TENS can be used for several hours at a time. The unit should not be used however, for extremely long periods of time (e.g., 24 hours) or during extended sleep time (use during naps is permitted but TENS should not be used while sleeping at night or while sleeping for more than a couple of hours). If you experience increased pain be sure to let your physiotherapist know. In some cases electrodes placed below the level of a peripheral nerve impairment might actually block the input from the TENS unit and cause increased pain. Placement over an area of scar tissue from surgery can cause increased skin resistance and decreased transmission of the electrical impulses. Fortunately there are no significant adverse effects from the use of TENS. Before applying the electrodes, it is important to remove all lotions, oils, or other applications to the skin. It is beneficial to shave hair from the local area where the electrodes will be applied. Never place an electrode over an open wound or area of skin irritation. Report any skin problems or burns immediately. Do not place electrodes near your eyes or over your throat. Do not use TENS in the shower or bathtub. It is advisable to alter the electrode placement slightly each time you put them on to avoid skin irritation. Intensity of the tingling sensation should be at a level that is comfortable enough to allow you to complete daily tasks and activities. It is recommended to keep a daily journal pain levels, the settings used, and a record of the medications being taken for pain relief. By reviewing these notes the best combination of electrode placement and unit settings that gives the most pain relief may be found. You should feel a mild to moderately strong tingling or buzzing sensation. Some people experience a more unpleasant sensation described as burning or prickling; continued use of the TENS in this case may not be appropriate, however this sensation may dull and become comfortable. Depending on the intensity and duration of your pain, you may or may not get immediate results. It can take several days or even several weeks to get the desired results. Differences in results may occur based on properties of skin resistance, type of pain, and individual differences in the mechanism of pain control. When using the TENS be persistent and patient and discuss any concerns you have with your physiotherapist. Many patients report good-to-excellent results, first with pain control, then pain relief, and finally with a reduction in the use of medications. Although it doesn’t happen for everyone, some chronic pain patients are “cured” permanently from their pain. As each of these benefits from the TENS treatment occur, you may find yourself increasing your activity level either with the same level of TENS usage or even with reduced frequency of use, intensity of signal, or duration of time that the unit is turned on. If for any reason your pain starts to increase in frequency, duration, or intensity, don’t assume the treatment isn’t working for you. First, check the TENS unit for any malfunction, the need to recharge the batteries, or the need to replace the electrodes with new ones. If your unit is battery-operated, you may find it necessary to turn the intensity up to obtain the same sensation when the batteries are low. This should alert you to the need for battery replacement. Finally, be aware that some patients experience “breakthrough pain,” referring to a situation in which you get pain relief at first with the TENS unit but then for some reason even with the TENS unit on you again start to experience pain. Needing to turn the intensity up high enough to cause muscle contraction is an indication of breakthrough pain. Sometimes a different setting for the stimulator may be needed when breakthrough pain occurs. Most units have a setting that allows for random pulse frequency, duration, and amplitude. The use of this setting helps keep the nervous system from getting used to a specific amount of stimulation and becoming accustomed to it, which is called habituation or adaptation. If you have a loss of skin sensation or even decreased sensation. With altered sensation, there is a risk of turning the unit up too high and causing an injury. If you have a cardiac pacemaker as the electrical signals could interfere with the pacemaker. Cardiac patients should not use TENS without their physician’s approval. If you have Alzheimer’s Disease, dementia, or other cognitive problems as the unit may not be used properly and can cause injury. Copyright (2013) theavenueclinic. All rights reserved.